Device market opportunities will explode from cars to toothbrushes, but only after some fundamental changes are made. There is a new generation of heterogeneous devices and component modules being developed for the IoT. This, in turn, could create an exploding market within certain sectors of the hardware industry. Exact size predictions for this market vary greatly, but all of the firms making these predictions agree on one thing—it’s going to be very big. A new report by Yole Developpement pegs the market size in the $70 billion range by 2018, with the next five years presenting a golden opportunity for device makers as the IoT enters the growth stage. By 2024, the report predicts that overall market value for components will exceed of $400 billion, of which more than 10% will come from hardware alone. Driving this growth will be technological advancements in areas such as power, wireless, and chip densities. The IoT will connect places, such as manufacturing platforms, energy grids, health-care facilities, transportation systems, retail outlets, sports and music venues, and countless other entities to the Internet. 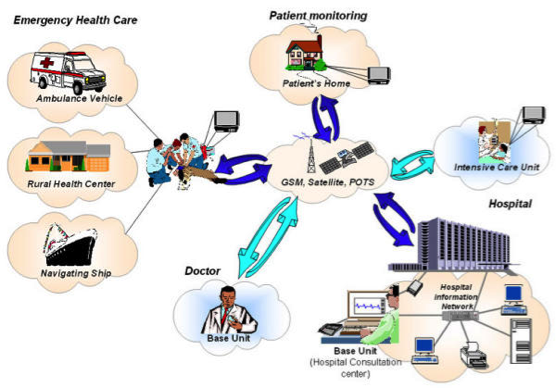 Typical IoT scenario in telehealth. Courtesy, biomedsearch.com. This will happen simply because of the economies of scale and demand. The prices for components and devices continues to decline while the skyrocketing global demand for 24/7 Internet access grows exponentially. The Internet of Things growth will benefit mostly from the autonomous machine-to-machine (M2M) connectivity that will make up the bulk of the objects of the IoT. 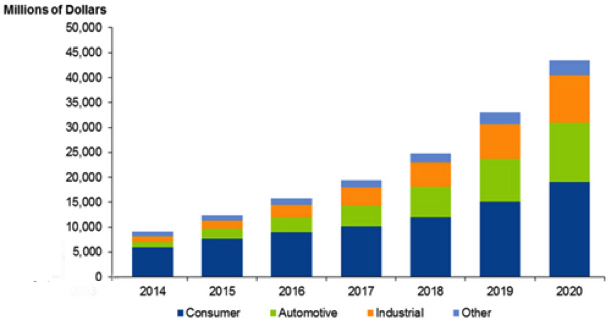 This is the main driver for double-digit growth across verticals in the electronics, and especially the semiconductor industry well into the next decade. General consensus is that the interconnect protocol of the IoT will be IP (Internet Protocol). As it stands today, the deployment of the billions of IoT objects can’t happen, simply because there just aren’t enough IP addresses with IPv4. And, there are some disparaging networks that are not IP-based, as well. While there is still some discussion about how to connect the IoT, most are in agreement that the IoT protocol will be IPv6. The first step will be to convert all proprietary networks to an IP-base. Then, the implementation of IPv6 can begin. A brief discussion of IPvX follows. IPv4 is a 32-bit or four-byte addressing scheme. By comparison, IPv6 is a 128-bit, or 16-byte addressing scheme. If you look at the binary code and do that math, two raised to the 32nd power comes out to 4,294,967,296, or roughly 4.3 billion distinct addresses. If one take two and raises it to the 128th power, the number is 3.4×10^38 addresses. That is nearly 8×10^28 times as many as IPv4. It is said that this number is greater that the number of grains of sand on this planet (although you have to wonder who counted them). With IPv6, there will be enough IP address for whatever the IoT can throw at the protocol. The main reason for choosing such a large address base is because it can be subdivided into hierarchical routing domains, which will better serve the IoT’s vast number of unique address demands. The 128-bit architecture is designed to support multiple levels of hierarchy, which is missing with IPv4. This, in turn, will allow a great deal of flexibility in the design of hierarchical addressing and routing. Such a flexible hierarchy is necessary because it will greatly simplify interconnecting the massive number of IoT devices, especially the autonomous ones. There is a small downside to IPv6, unfortunately. Intrinsic interoperability between these protocols is not possible. That has added some complications to the development, resulting in a bit of obfuscation to the transition for IPv6. However, there is development on transliteration mechanisms that will pass communication between the two hosts. Eventually, IPv6 will become the default protocol of the IoT. The growth of the IoT will present some very interesting issues in a variety of areas. Interconnect will be one of them, but that one will see some very fast activity because unless it gets resolved there will be no IoT as it is envisioned. So one can expect that there will be very little resistance along the IPv6 pathway. But that isn’t likely to be the case for the the rest of the IoT. “One problem with IoT is that it is a vague definition,” said David Jacoby, security analyst at Kaspersky Labs. “Do we simply mean ‘connected devices?’” That is a good point. One of the main issues, which will only get worse as the IoT evolves, is how are we going to categorize all the different objects, for example. What that translates into is a very well understood, mature, low-cost, and available platform that can be integrated into all but the most demanding IoT devices. “The basic IoT device has three major elements; a sense, a compute, and a transmit. Five years ago, these three elements could not be produced in a cost-effective manner,” noted Morrison. What this means, in terms of IoT growth, is that we now have a platform semiconductor manufacturers can leverage that is very cost-effective, easy to produce and mature. So there will likely be tremendous competition among these manufacturers to capture market share. That may be a double-edged sword, however. With billions of potential products having, perhaps, dozens of semiconductor houses vying for the business, competition will be stiff, and it could create an environment where margins are razor thin and cost is the determining factor. While that puts product out the door and keeps cash flowing, that is not the model that chip manufacturers like to see in most cases because, unless the CapEx is very tightly controlled, there is little margin for error. Morrison added that once the initial roll out of IoT objects is completed, the demand for silicon could drop off radically. It may not see the same growth rate as smartphones, he said. Smartphones and tablets tend to get replaced at a fairly regular rate. “There are always new and better devices, and the smartphone industry has done a marvelous job of convincing us they need replacing every six months to a year.” But with many of the IoT appliances, the replacement rate could be years, even decades (smart meters, major appliances, home media devices, etc.). So what may seem like a multi-billion device market at the onset, may reach a saturation level where new introductions slow way down and replacement devices may take a long time to cycle. In any event, depending upon which direction one looks, the growth of the IoT and the issues that can plague it, vary widely. No one is willing to really put pencil to paper and go on record for how or when the IoT will grow and what the major issues are that will come with that. Security will be challenging for a rapidly growing platform, as well. 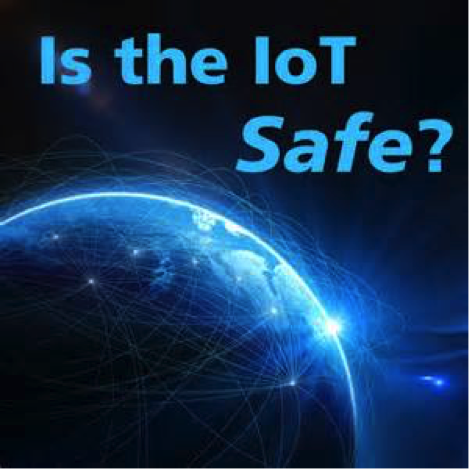 Many of the security issues of the IoT are the same as present security issues within today’s Internet. Some will be the same in the IoT, except they will be much more pervasive. Others are yet to be discovered. This is a wakeup call for the various industries playing in the IoT. Not all devices need to be reinvented, but they do have to be thought through in a new context. Perhaps of all the variables that one can think of around the IoT, the growth issue is on the ground floor. Whether it breaks all records, in rate of adoption and unbridled growth, or just fits and spurts its way to its final form, it will affect nearly every segment of technology going forward. The real issue is trying to call it. A lot of money is on the table with this one. Overestimate and there is the chance that too much inventory will be produced, and it will sit idle, eating the capital invested in it. Underestimate and the window of opportunity to get product out there in volumes, can slip away. As Morrison noted, “Currently, the consumer hasn’t yet realized the value proposition for the IoT. Right now, the only thing that is taking off on the IoT is the Nike Fuel Band or the Apple Watch, and the like.” The consumer likes the gee-whiz factor of such devices, or so they will drive the semiconductor production for devices like that. So we will see blips in certain segments as the IoT grows up. But how fast this takes off, and in exactly what segments is unknown at this point. And there are still issues to overcome before we see widespread adoption. IoT has one big flaw. You have to rent the cloud services to make them work. If you want to control your toaster from your bedroom computer, you have to have an account with some service, and send the commands around the earth just to get to the toaster. I guess it’s good for the ISP’s, they make a ton of money, and get lots of data on peoples’ use of toasters and thermostats. Already Fitbit information is being requested by judges in trials. The security leaks from IoT is too great. Why should your toothbrush or home thermostat feed information back to large corporations and be made available for government snooping and control?